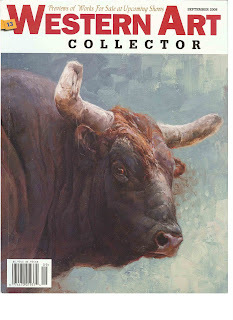 I had an interview with Michelle over at Western Art Collector magazine today. She was very easy to talk to and work with. She's putting together an article of my artwork for the November issue. I'm excited about this opportunity. It was part of a prize I won from the juried Greenhouse Gallery's Salon International. I didn't know that a feature article was part of the award. But, lucky me. Here is a copy of this month's mag. Watch for November's . So good to hear from you! Looks like you are new to the blogging world...Welcome! I want to see more pictures of your family. They all look so big. Hope life is well there. Tell your girls I said Hi! We just had the girls, leila and alisha, here in august. (with husband bob and boyfriend chris) It was so fun.I'll tell htem you said hi.